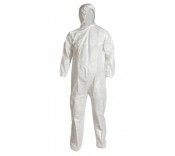 Disposable coverall with an elasticated hood, cuffs, ankles and a front zip. Individually wrapp.. These individually wrapped Non-Woven Coats offer great barrier protection making them perfect for..
Cat III Complex Design Conforms to EN 13982-1, EN 13034, EN 1149 Type 5/6 protection Limite.. Simple and effective solution for hygiene and cleanliness. Elasticasted ankles and embossed for..
• High quality overshoes • Elasticated for extra grip around shoes • Anti-slip textured surface at..